Maria Theresa was born on 13 May 1717 as the second but eldest surviving child of Charles VI, Holy Roman Emperor and Elisabeth Christine of Brunswick-Wolfenbüttel in the Hofburg in Vienna. Her elder brother John died aged seven months. She had two younger sisters but no other brothers. Her father paved the way for accession with the Pragmatic Sanction of 1713, though he never stopped hoping for a son. 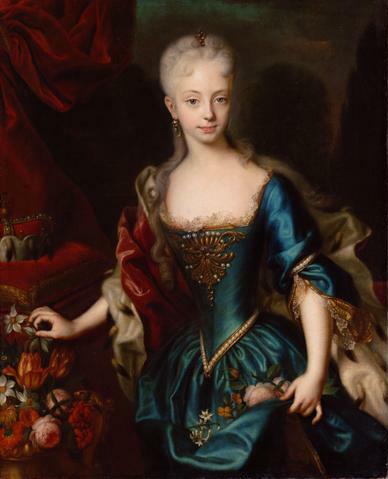 The Pragmatic Sanction of 1713 ensured that the Habsburg possessions could be inherited by a daughter. 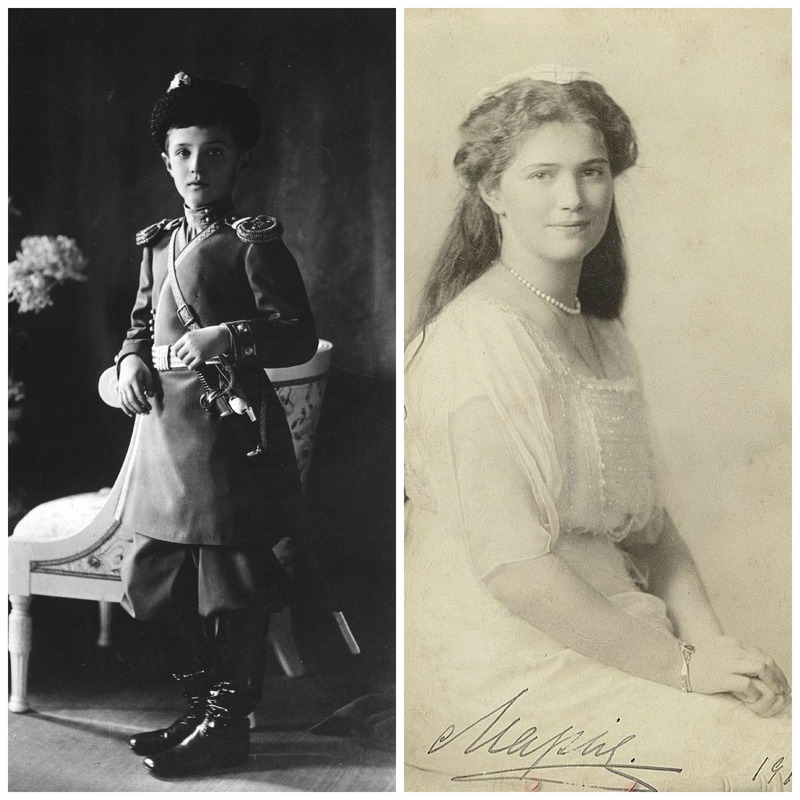 Despite being her father’s heir she was never properly prepared for her role as sovereign, but instead had an education more suited to that of a consort. The question of her marriage was raised as early as 1723. She was engaged to Leopold Clement of Lorraine, but he died of smallpox before the marriage could take place. Instead, his younger brother Francis Stephen was considered as a candidate. He came to Vienna despite the fact that Maria Theresa was betrothed to Charles of Spain. This betrothal was opposed by many other European courts as Charles was heir to the throne of Spain. Her father renounced the betrothal to please them. Meanwhile, Francis Stephen was still in Vienna, at least until 1729 when he became Duke of Lorraine. He was finally officially betrothed to Maria Theresa on 31 January 1736. He was forced to give up the Duchy of Lorraine by Louis XV of France, and in return, he was made heir to the childless Grand Duke of Tuscany. Francis Stephen en Maria Theresa were married on 12 February 1736. Maria Theresa had liked him since his arrival in Vienna, and at least from her side, it was a love match. Francis Stephen, on the other hand, kept mistresses. Maria Theresa succeeded on 20 October 1740 when her father died. She was inexperienced and considered her husband to be the more experienced party. Despite the Pragmatic Sanction of 1713 some of Europe’s sovereign broke their promise, mostly because they wanted their share of the inheritance. It began the War of Austrian Succession which only ended eight years later with the Treaty of Aix-La-Chapelle. 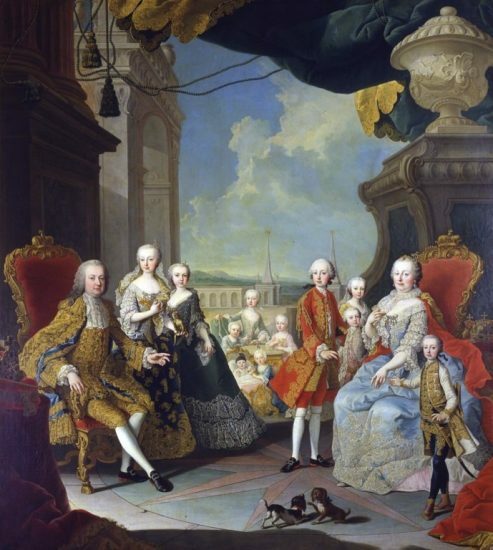 Between 1737 and 1756 Maria Theresa gave birth to no less than sixteen children. Her first three children were daughters, causing much disappointment. Between constant pregnancies and several wars, Maria Theresa claimed she would have gone into battle if she hadn’t always been pregnant. Eight of her children did not survive to adulthood. Several died of smallpox. Two of her sons became Holy Roman Emperor, while her daughters were respectively Duchess of Teschen (Maria Christina), Duchess of Parma (Maria Amalia), Queen of Naples and Sicily (Maria Carolina) and Queen of France (Maria Antonia). She was a devoted mother, and she wrote to them at least once a week, but she also used them as pawns in the marriage market. She frequently reprimanded her daughter Marie Antoinette (or Maria Antonia as she was known before her marriage) for failing to conceive a child. Her husband died in 1765 and her son Joseph succeeded as Holy Roman Emperor. Maria Theresa dressed in mourning for the rest of her life. Her health also went downhill after that. She had smallpox in 1767 from which she probably never fully recovered. She suffered from oedema and various other illnesses. 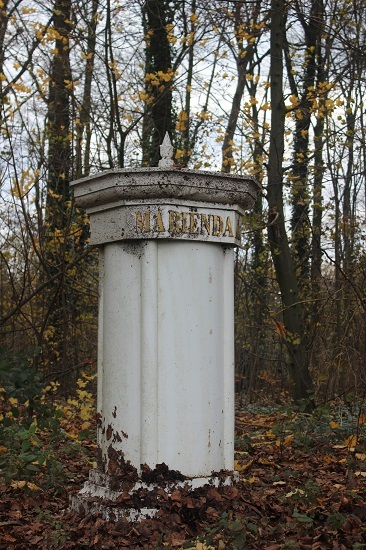 By 1780 she was seriously ill. On 28 November 1780, she asked for last rites, and she died the next evening surrounding by her remaining family. Her forty-year reign left a completely different empire than the one she had inherited. She had breathed new life into it. 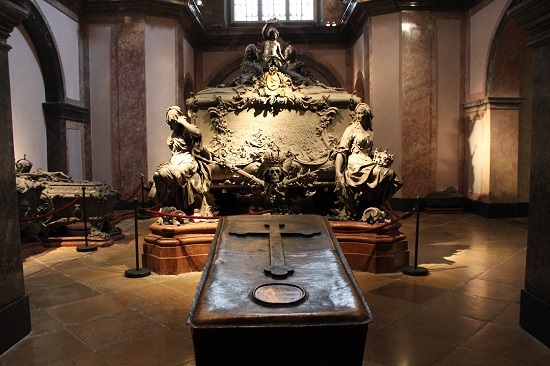 Maria Theresa was buried in the Imperial Crypt in Vienna next to her husband Francis Stephen in a magnificent tomb.